For some people, eating copious amounts of raw leafy greens is not on top of their daily wish list. Yet, we have to do it … to provide our bodies with the nutrients that they need to ward off disease and perform optimally. The health benefits of raw, dark leafy greens are undisputable, plus they are easy to grow in our Canadian climate and therefore a must-have in our vegetable gardens. If you saved seeds from last year’s kale plants then spread a few around and enjoy baby greens in your salads, within a few weeks. They do fairly well with the “cut and come again” method of harvesting greens. 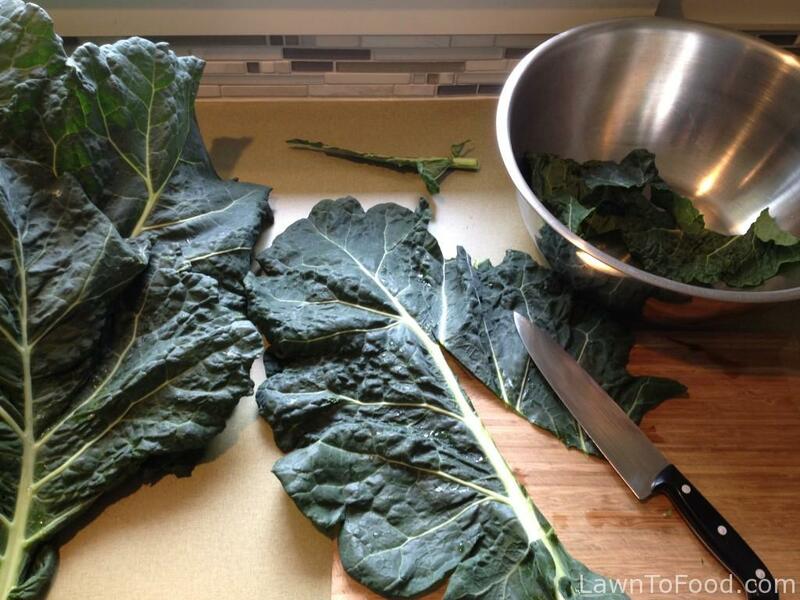 We prefer to use the larger kale leaves in our meals and smoothies. I cut the lower leaves off of the kale, allowing the plants to continue to grow upwards. 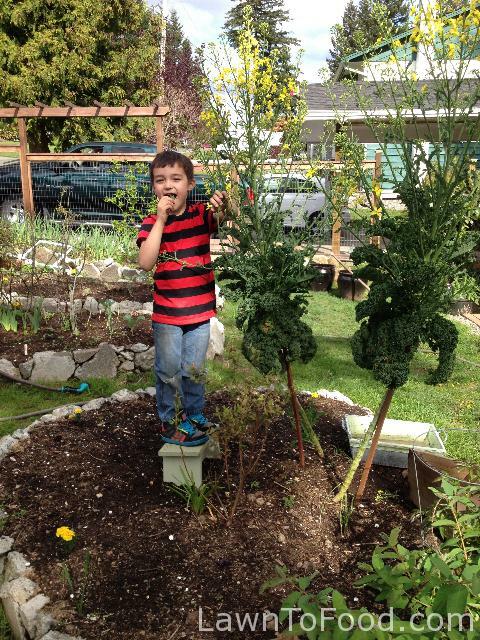 These 1 year old kale plants grew almost 5′ tall, before going to seed this spring. 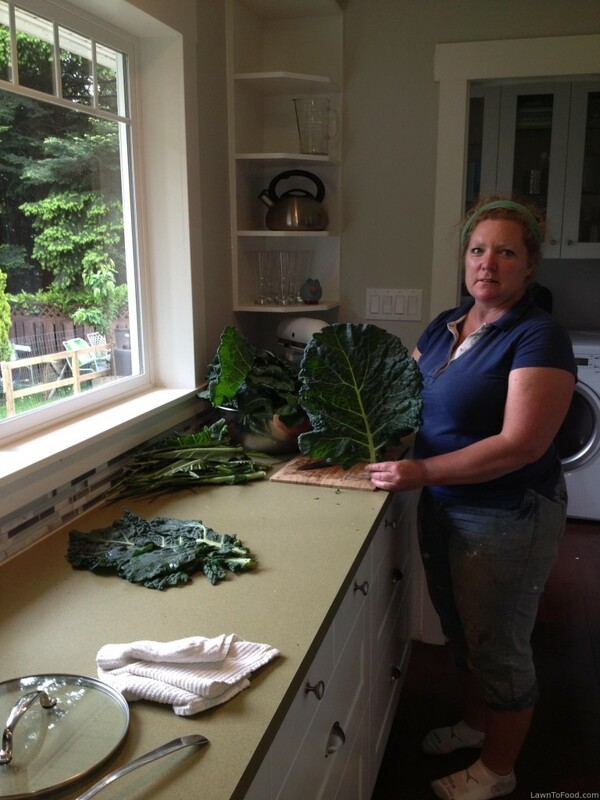 This year we had huge success with our winter collard greens. I planted out 8 plants in late October. 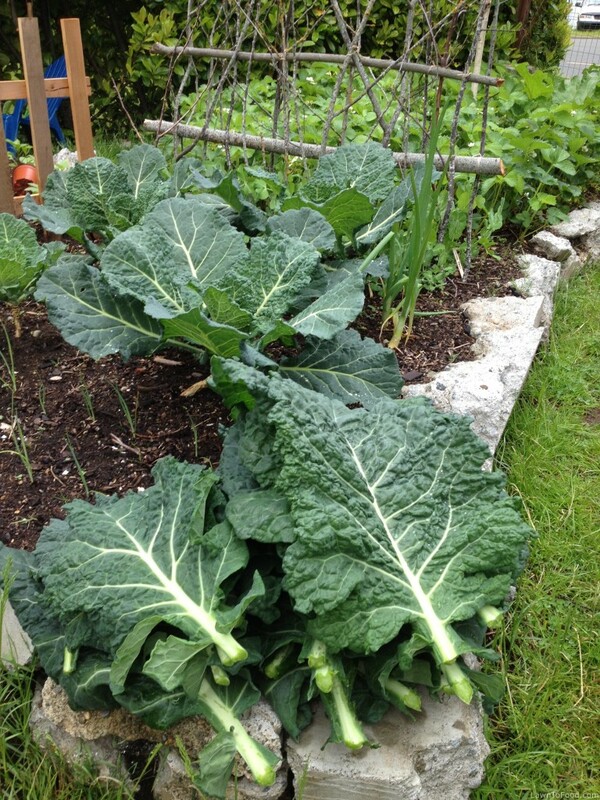 They grew all winter, producing large leaves that I cooked in soups, casseroles, cabbage rolls, lasagna and chopped finely for coleslaws. When spring rolled around, the collard greens exploded with rich, dark vibrant leaves. I have so many collard green leaves that I’ve had to come up new ways to prepare and preserve them. The leaves are so large, I immediately tried to think of ways that I could reduce their bulk to take up less storage space. Dehydration was my answer. 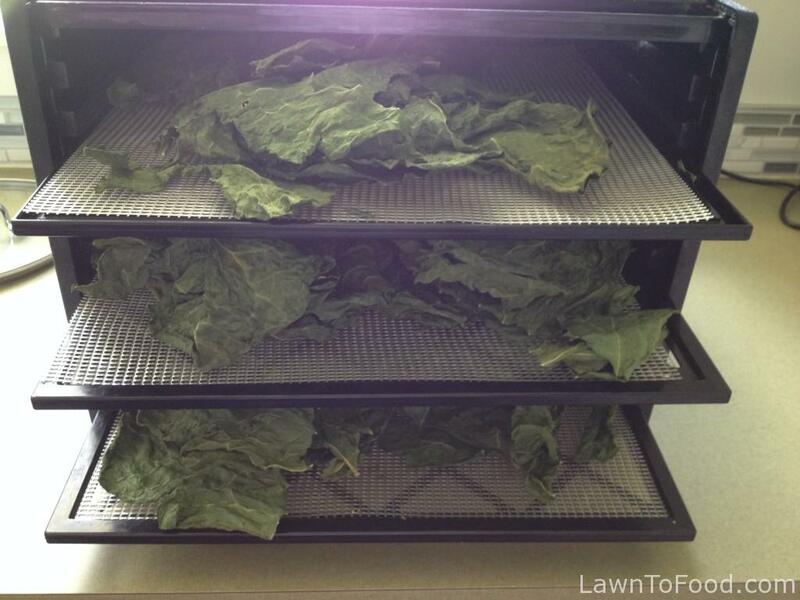 Dehydrating preserves raw enzymes and delicate nutrients that the leaves contain, if you set your food dryer to 115 F.
I started by harvesting a lot of leaves and then washed them throughly. Next, I cut out the center stalk, just leaving the leafy green part to dehydrate. I ripped the greens into smaller pieces and loaded (I mean stuffed!) the food dehydrator trays. I started the dehydrator on high temperature for about and hour to really kick-start the drying process. The food itself didn’t reach the high temperature, it just helped to remove the initial moisture from the plant. After 60 minutes, I turned the temperature down to 115 F and left it on for about 5 hours, until the leaves were completely dry. Crispy collards! It is truly amazing how the bulk of the plant is so drastically reduced by drying. 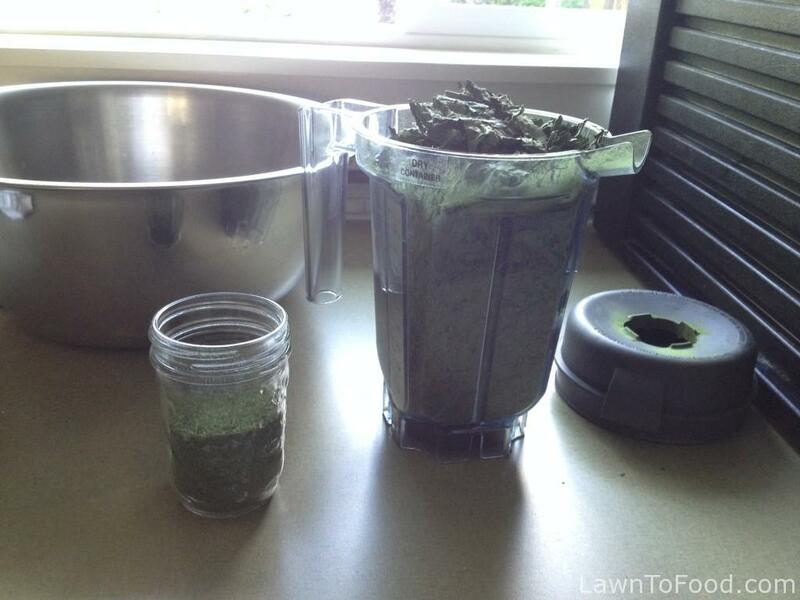 Next, I took the crispy collards and put them in a blender. The dry greens pulverized in seconds. I calculated that 1 cup of fresh greens were reduced to 1 tsp of powder. We have been adding 1 tsp of this nutrient rich collard powder to our morning smoothie. I have also added it to guacamole and other dips, to boost health benefits without any one even knowing! 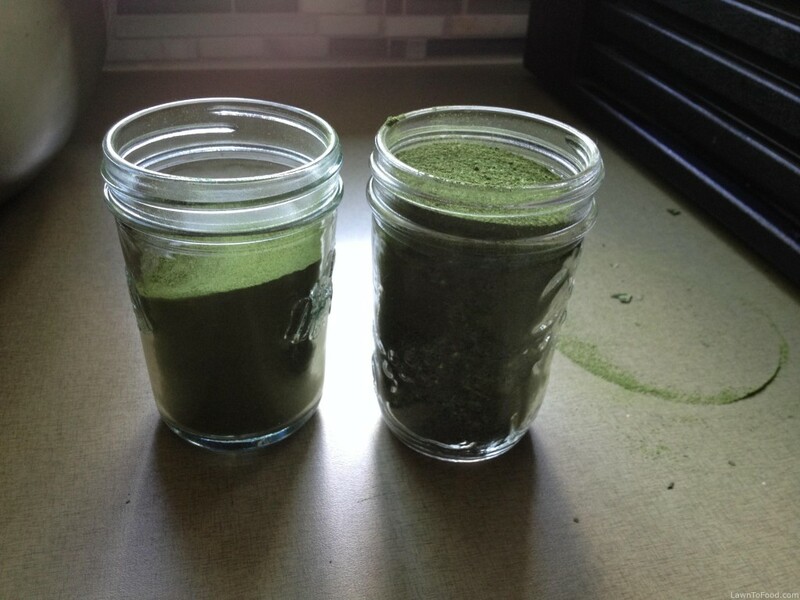 That huge pile of collard greens was reduced to 2 half pints of powder. I keep the jars sealed to prevent moisture from rehydrating it. What are your favorite ways of preparing and preserving, the super-foods, like kale and collard greens? This entry was posted in Fresh Vegetable Ideas, Growing Food, Let's Eat, Preserving & Using Preserves, Reep the Harvest and tagged collards, dehydrator, green powder, greens, kale, smoothies by Lynda. Bookmark the permalink.